Tuna flakes with a little soy sauce and ginger infused extra virgin olive oil (5%) and mushroom couscous. Carefully selected premium spices, blended with extra virgin olive oil and drizzled over succulent Tuna. John West Infusions, simply delicious! Looking for something that's easy to prepare, warm, filling and packed full of flavour? John West Steam Pots are the answer. 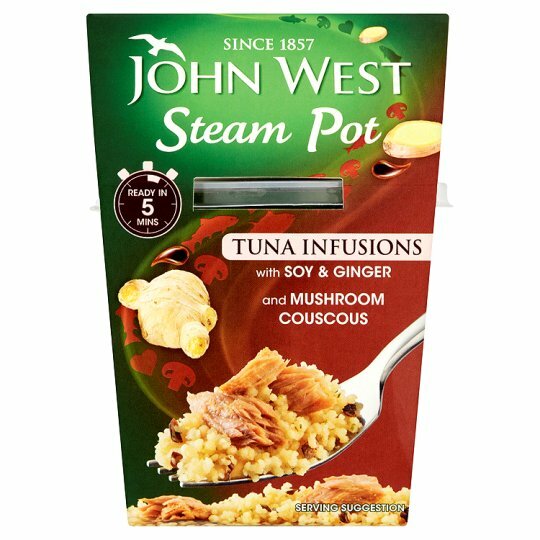 We've paired our Tuna Infusions with a pot of perfectly seasoned couscous to create a fast, filling and flavoursome lunch. This one's a taste of the Orient! Keep in a cool dry place out of direct sunlight. Simply add boiling water to the pot of couscous. 1 Remove the plastic lid from the couscous pot and gently peel back the seal. 2 Simply add boiling water to fill line (approx. 135ml). Then give the couscous a stir. Take care not to under or overfill, we want your couscous to be perfect! 3 Seal in the steam by popping the lid back on for just 5 mins. 4 Add the John West Infusion with Soy and Ginger to the hot couscous and stir. Mix in a little at a time if you prefer.